Shuttle Discovery is being prepped for its STS-119 mission to the station. 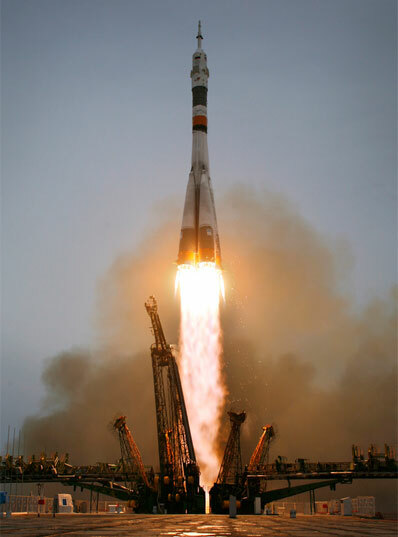 As the shuttle Discovery orbited more than 70 miles in front of the international space station, a Russian Soyuz rocket took off today from the Baikonur Cosmodrome in Kazakhstan carrying the station's next commander, a NASA doctor and a wealthy space tourist. With Expedition 19 commander Gennady Padalka and flight engineer-physician Michael Barratt at the controls, the Soyuz TMA-14 spacecraft blasted off from site 254 - Yuri Gagarin's launch pad - at 7:49:18 a.m. EDT. Joining them for the two-day trip to the station was Charles Simonyi, a Hungarian-born U.S. software developer making his second multi-million-dollar visit to the lab complex. Today's launching appeared flawless and nine minutes after liftoff, the Soyuz slipped into its planned preliminary orbit. There were no technical problems of any significance and the crew was in good spirits. Padalka and Barratt will join Japanese astronaut Koichi Wakata aboard the station and replace Expedition 18 commander Mike Fincke and flight engineer Yury Lonchakov, who are in the final days of a five-and-a-half-month tour of duty. Fincke, Lonchakov and Simonyi will return to Earth April 7 aboard the Soyuz TMA-13 spacecraft that carried the outgoing station fliers into orbit last October. Wakata, Japan's first long-duration station crew member, hitched a ride to the outpost aboard Discovery. He replaced outgoing flight engineer Sandra Magnus, who is returning to Earth aboard the shuttle after a four-month stay in space. Today's launching marks a milestone for NASA and the Russian space agency, the first of two flights intended to boost the station's crew size from three to six. 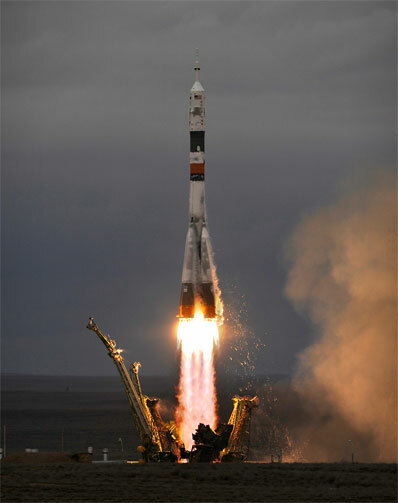 In late May, another Soyuz is scheduled for launch to carry three more crew members to the lab: cosmonaut Roman Romanenko, a second-generation cosmonaut, European Space Agency astronaut Frank De Winne of Belgium and Canadian Space Agency astronaut Robert Thirsk, a shuttle veteran. Discovery's crew helped pave the way to six-person crew operations by delivering and installing a fourth and final set of solar arrays, doubling the amount of power available for science operations, and a replacement centrifuge for the station's water recycling system. "To put this into perspective, it's not just that we're doubling the crew size, we're actually up manning to adequately staff the space station, if you will," Barratt said. "It's very large and very complex and to get the maximum productivity out of it, we need six pairs of hands aboard. "So for that reason, we all understand that whatever small difficulties there are in dealing with that many more bodies and competing for resources, we need that many bodies and there's a lot more to pitch in when help is needed and again, to get the maximum productivity out of it." If all goes well, Padalka, Barratt and Simonyi will dock with the space station Saturday around 9:14 a.m., just four-and-a-half hours before Discovery's planned landing at the Kennedy Space Center to close out the 125th shuttle mission. Touchdown at the shuttle landing strip is targeted for 1:38 p.m. The shuttle crew plans to unlimber the ship's robot arm later this morning for a post-undocking inspection of the ship's reinforced carbon carbon nose cap and wing leading edge panels. The inspection is designed to spot any impact damage that might have occurred since an identical survey was carried out the day after launch. The astronauts plan to pack Friday for the trip home.